Fantastic Four has a thoroughbred cast—Miles Teller as Reed Richards, Jamie Bell as Ben Grimm, Michael B. Jordan as Johnny Storm, and Kata Mara as Sue Storm—but they are saddled with a script worthy only of nags. The latest reboot of the Marvel franchise is an origins story that is practically stillborn, a tale that spends more time with the construction of a teleporting machine than it does giving the quartet anything “fantastic” to do. This is an adventure story in search of an adventure, which it only finds well into its third act, long after it is possible to care about the characters or what happens to them. At that point, angered that government suit Dr. Allen (Tim Blake Nelson) wants to take their toy and give it to NASA, Reed, Johnny, and arrogant cohort Victor Von Doom (Toby Kebbell), with Reed’s childhood BFF Ben in tow, suit up and make a drunken journey to the far-off world their lab monkey so recently visited. 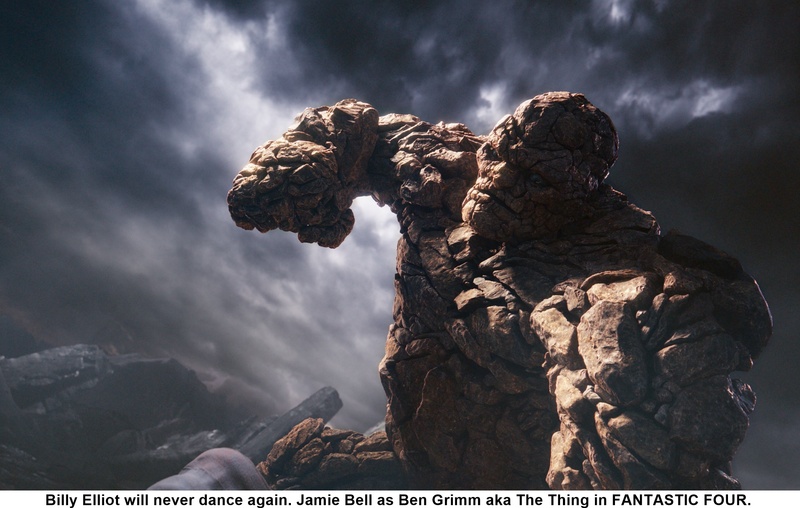 Depending on one’s viewpoint about body-altering superpowers, the trip is a disaster, particularly for poor Ben who becomes the rock creature The Thing. Billy Elliot will never dance again.